An advertisement page dedicated to BTS was found in the 'Billboard' magazine. Recently, a photo taken by an ARMY quickly spread online as it showed an ad for BTS' a possible submission into the 'Grammy Awards'. 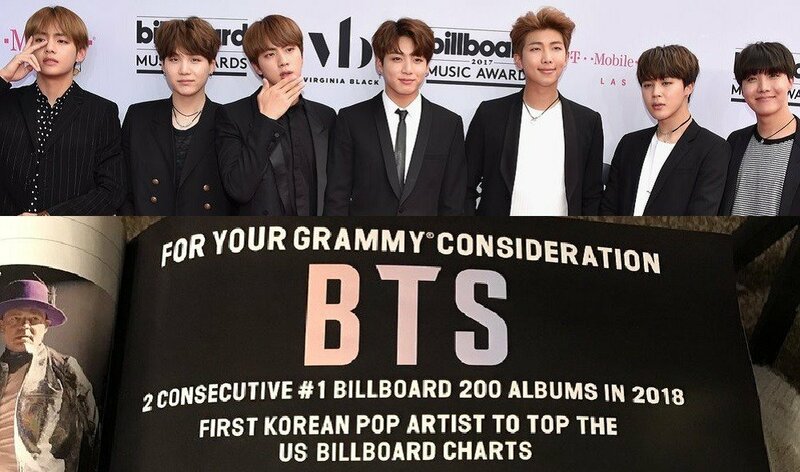 To promote all of BTS' achievements so far, the ad pushed for their Grammy consideration, an award show that SUGA had long�expressed his wishes to attend. From their rankings on the Billboard charts to 'YouTube' records and ARMY fan power, the list outlined the positives that would potentially help BTS obtain their Grammy goal. The exact source of the advertiser is still unknown, but some suggest that it might be Big Hit Entertainment or Columbia Records, judging by the official logos at the bottom. Check out the post below! Do you think you will see BTS at the Grammy Awards one day? When BTS get nominated i wonder what haters gon say next ?? I would love it if they get nominated, not win, nominated. Having a nomination is good enough for any artist and is an honor, they will forever have "Grammy Nominated Artist" in front of their name. That is how big this award show is.